WWI 29th Division 115th Infantry Regiment Panoramic Yardlong Photo – Amazing Details! One of the hardest parts of collecting WWI panoramic photography is presenting it in a manner that allows for many people to view it. Each of my scanned examples takes at least an hour to scan in sections, and then digitally splice together. Here is a particularly good example from H Company of the 115th Infantry Regiment of the 29th Division. Note the Native American soldier as well as two soldiers wearing the ribbon for the Distinguished Service Cross (DSC). Sorry about the large file size. Click HERE for the H Company, 115th Roster! This photo was made into a giant panoramic painting! 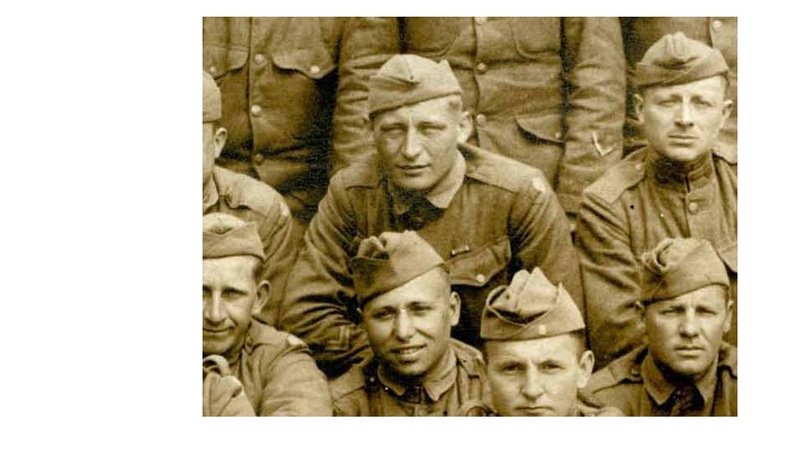 I actually was able to do some research on Company H of the 115th and found some info on a few members that I was able to identify in the photo. The President of the United States of America, authorized by Act of Congress, July 9, 1918, takes pleasure in presenting the Distinguished Service Cross to First Lieutenant (Infantry) Robert S. Landstreet, United States Army, for extraordinary heroism in action while serving with 115th Infantry Regiment, 29th Division, A.E.F., near Bois-de-Consenvoye and Bois-de-la Grande Montague, France, October 8 – 16, 1918. On October 8 First Lieutenant Landstreet led his platoon through machine-gun and rifle fire in an advance which resulted in the capture of 300 prisoners and 12 machine-guns. On the morning of October 16 lie volunteered, with one sergeant, and straightened out the line of an adjacent unit. His movements were under constant machine-gun fire, and so close to the enemy that he, with his sergeant, captured two prisoners while accomplishing their mission. The President of the United States of America, authorized by Act of Congress, July 9, 1918, takes pleasure in presenting the Distinguished Service Cross to Sergeant Hugh P. McGainey (ASN: 1285511), United States Army, for extraordinary heroism in action while serving with 115th Infantry Regiment, 29th Division, A.E.F., near Verdun, France, October 8 – 15, 1918. 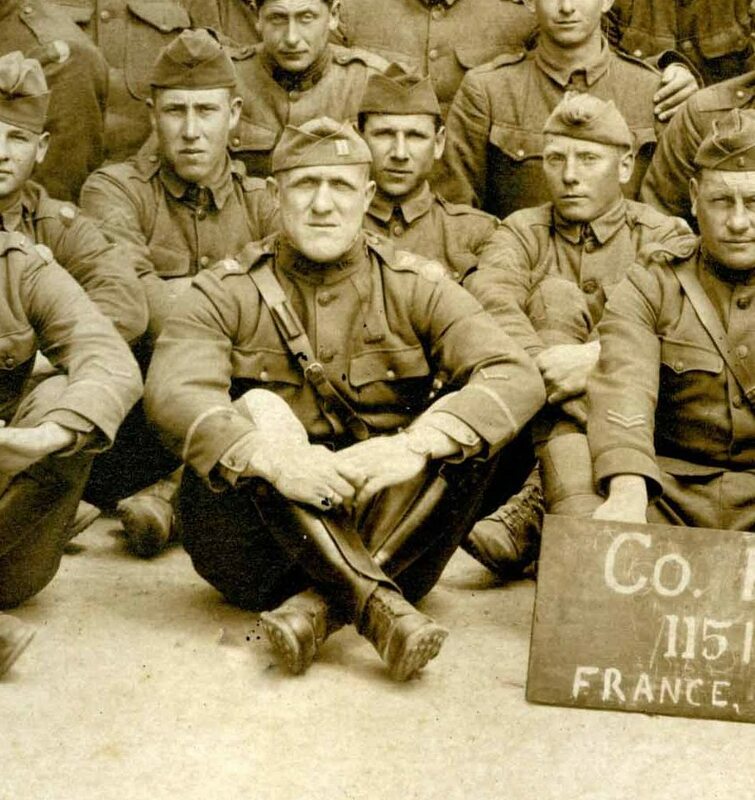 In the Bois-de-Consenvoye, east of the Meuse, Sergeant McGainey, in command of his platoon, led his men, under heavy machine-gun fire, and captured approximately 500 prisoners, three fieldpieces, and many machine-guns. On October 15 he voluntarily exposed himself to warn his men against gas, and was wounded by shrapnel. He refused to go to the hospital until ordered to do so by the medical officer. Company H, 115th Infantry. For extraordinary heroism in action near Verdun, France, October 17th, 1918. In the Bose de Consenvoye, east of the Meuse, Pvt. De Berdaninis, acting in the capacity of a runner, carried three successive messages through heavy barrage of both own own and the enemy’s artillery, traversing a patch where two men had previously been killed by the same barrage. Home address: Louis Brino, 3921 Pratt Street, Baltimore, MD. “Looking at the Robert lands tree photo. We tried to find the place where this photo was taken in France. The sergeant standing at the far left of the photo is my Grandfather. His name was Paul R. Gilbert. He lived his life in Baltimore and died in 1960. Very, very cool! Do you happen to have a photo of him you would be willing to share? I could add it as an addition to this post along with any info you’re willing to share. My Grandfather was with these Co. H guys. He was in Co. E. Have you any thing about Co. E ? I have his letters home and he mentioned a full blooded American Indian being in his tent at one time in Anniston, Alabama. Great stuff, hey what? Wonder if the guy in the photo is the same one. I’d bet he was. Interesting! I wonder if the Native American was the same fellow. I should track down a copy of the 115th unit history to see if there’s any related info. Sorry, nothing in my collection for E Company. Thanks for stopping by! Hello, Attached letter scanned indicates the American Indian in your amazing photo may be “Trotting Wolf”. The letter says it all. Thanks for the history effort. My Great Great Uncle, William Kempa was in Co E 115 INF. Enlisted in 15 Feb 1915 and was discharged 6 Jun 1919. I live in Italy and I love to draw. The next year there will be the first centenary of the First World War, and I’m collecting images of the Great War to draw, to remember that horrific tragedy. During my research on the internet, I discovered with great pleasure your site. I will give kudos: bravo! I am very impressed by the photos “WWI 29th Division 115th Infantry Regiment Yardlong Panoramic Photo,” and I’d like to make a monumental drawn of your photo (eg: 500 x 140 cm.). The purpose of the great drawn is not commercial, but it’s just to remind the youth of America and many other young people who fought (and many died) in Europe in a show that I hope to organize for next year. For this reason, I ask politely if you can authorize me to use the photos to make a monumental drawn. While waiting for a reply, I greet you cordially. Best regards and best wishes. Sergio. Fantastic! I would be honored to allow you to use the image. Although I own the physical copy, I feel that the image belongs to everyone. Will this be a mural? Thank you very much for your prompt and positive response. I am very happy. The drawings I do, even though they are not large murals, but drawns are in b / w done in pencil on Fabriano Artistico paper of large size. To give you an idea of the work that I do, these days, for exemple, I’m finishing a drawn of 320 cm. x 200 cm. I have taken from an old photo of 1913 with the band of Belgaum (Pv) and which will be presented next September when we will celebrate the centenary of the foundation of the band. I will keep you informed when I start to do the drawn, and of course I will mention your website at the bottom of the drawing. Thanks again for your great kindness. Your site has become one of my favorites, and I will follow you every day. PS: my two grandfathers who fought in the Great War. Excuse my English school. Last question: what are the dimensions of the photograph? Great photo. I’m looking for Frank Casale from Hartford, CT. He is listed as being in this infantry and division and is listed in the roster. If anyone has any inkling, I’d appreciate it. Thank you so much. One other question is that he died in 1921 and is buried in Hartford, CT. I’m wondering how he died since the war ended in 1918? He eventually moved to his grandparent’s farm in Henrietta, NY, where he worked, later married and moved to Fairport where he raised a family and retired in the early 1960’s. He died April 4th, 1972 in Lakeland, Florida. I still remember seeing the bullet wound scars, one on either side of his right shin. Story goes that if the German Machine Gunner had moved quicker while sweeping the American line my Grandfather’s leg would’ve been shattered and probably lost it on the battlefield or the hospital tent. Instead both rounds missed his shin and exited without doing any more damage. Dear Brennan, Hi, greetings from Italy. I finished the drawing of the 115th infantry, which in July 2013 I told you that I would do. The dimensions of the drawing are: 26.3 feet long and wide feet 6.57. How can I send you some photos of the drawing? The drawing will be on display in an exhibition on May 24, 2015 at my country Arena Po (Pavia) in Italy. Best regards and Merry Christmas, Sergio Bollani. Dear Brennan, today my friend has put up a You tube video of my drawing of the 115th infantry company h. I apologize in advance on the quality of the movie. I’ll try to do better next time. I believe, however, that the movie gives the idea of my work. 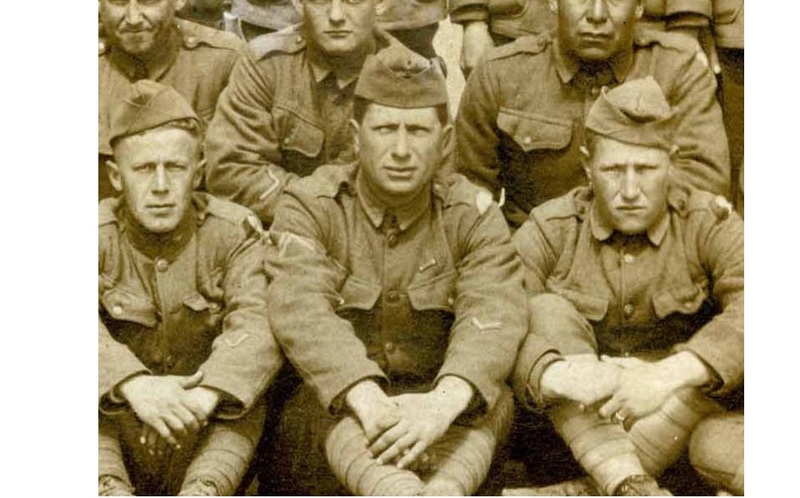 My grandfather, Samuel Sutton, served with B Company, 115th Regiment, in World War I. I still have his 29th Division flag and his copy of the Division’s History in WW I. Just a few years ago, my father donated his division/regimental unit photos (similar to the one displayed above) to the Maryland National Guard. One was taken at Camp McClellan, Alabama, in 1917, and the other was taken after the war, upon returning home, I believe. I am another grandson of Paul Gilbert. Both my cousin Paul and I were named for him. He went on to be a Shift Commander at the Baltimore City Jail, and Commander of the Baltimore City VFW Unit. Looking at the Robert lands tree photo. Over his right shoulder, our left. Is George Anible of Michigan. Wow! Thanks – I will amend the post with your info! Paul R. Gilbert won the Silver Star during his service with the 115th. I do not know details. Fantastic! I’m researching my great uncle Frank Jones who was a Lieutenant then a Captain in Company G of the Maryland 5th which got merged with other MNG units to form the 115th as I understand. This photo and how amazingly detailed it is gives me a better sense of what his world was like there. Thanks for posting it! Would you have anything on the 110th Machine Gun Battalion ? Also from Baltimore and in the 29th Division? Wonderful! Thanks so much. Great Grandma’s brothers from Baltimore were both in the 29th, one served in the 110th MG battalion and another in the sanitary train. Great to see the unit on display like this!